Lake of the Woods CA Visitors Center | Lake of the Woods Real Estate & Homes For Sale, Maps, History, Local Events, Recreation, Directions, Photos & More! Lake of the Woods Living – Peaceful. Scenic. Retreat. 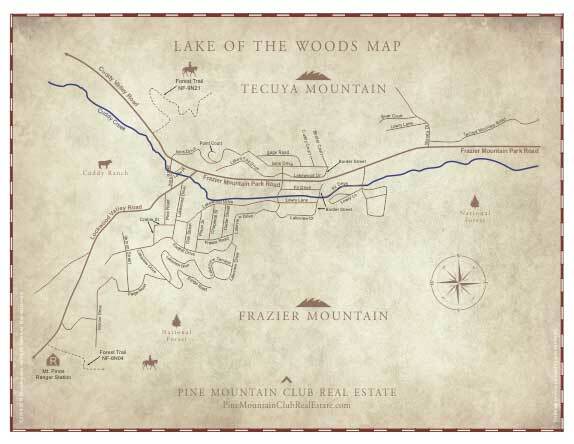 Lake of the Woods is nestled on the north facing slope of Frazier Mountain just west of Frazier Park surrounded by the Los Padres National Forest. This small alpine residential community provides a peaceful living environment with panoramic views of the San Emigdio mountain range, fresh air, blue skies, and access to some of the best year-around outdoor recreation in Southern California. You’ll enjoy immediate access to the Los Padres National Forest with endless trails for exploring, hiking, biking, 4x4 recreation, and horseback riding. During the winter months, you can head up to the nearly 9000 foot Mt. Pinos summit for some of the best cross-country skiing in the United States. Nature lovers will enjoy the abundant wildlife in the area during the spring, summer, and fall months. California quail, California mule deer, fox, hawks, owls, jays, blue birds, cotton tail and jack rabbit are just part of the natural Lake of the Woods landscape. Neighboring Lockwood Valley is home to Piru Creek for fishing, kayaking, and camping. If you like to go off-road, Los Padres National Forest trail heads are just minutes away and offer some the best mountain scenery in Southern California. At the center of nearby Frazier Park, you’ll find a beautiful 28 acre community park dotted with California oak trees and a natural spring fed pond. The park offers fishing, barbeques, baseball diamonds, a children’s recreation area, enclosed skate park, and a community club house. The park is the center for many annual events, celebrations, and activities in the mountain area. Lake of the Woods residents also enjoy year-around access to the 19,000 acre Hungry Valley State SVRA Park with its 130 miles of scenic trails for off-road vehicles. For mountain biking enthusiasts, the 8,000 acre Ballinger Canyon area is especially popular. You'll find 68 miles of routes that vary from sandy washes to ridgeline trails. The relatively dense route network provides many opportunities to make loops of varying dificulty. If you enjoy water sports, own a boat, or like to fish – Pyramid Lake is a just few minutes south on Interstate I-5. The mountain area is a wonderful place to own horses. 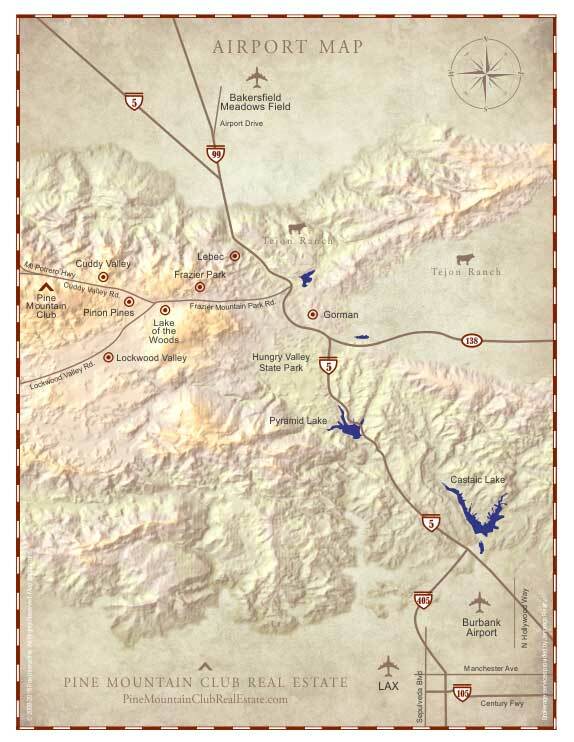 You’ll find stables bordering the National Forest in neighboring Lockwood Valley, Cuddy Valley, and Pine Mountain Club. Lake of the Woods is home to approximately 500 residents. Properties range in size from residential lots to multi-acre parcels. Homes in Lake of the Woods are custom built and range in size from small cabins to expansive family residences. Properties located at the higher elevations border the National Forest. Portions of Lake of the Woods are zoned for horses and boarding is available in neighboring Cuddy Valley and Lockwood Valley. Lake of the Woods is part of the unincorporated area of Kern County. You’ll enjoy a four season climate in Lake of the Woods with average temperatures ranging from 80° during the day to 60° at night in the summer and 58° during the day to 34° at night in the winter. Expect mild summer temperatures with light breezes during the day and a natural cooling down in the evening hours. At an elevation of 5000 feet, Lake of the Woods occasionally receives light to medium snow fall during the winter months. The surrounding Los Padres National Forest offers Lake of the Woods residents protection from future development. There is no industrial zoning in the area that could threaten the environment or landscape. The residential roads in Lake of the Woods are paved and maintained by Kern County. The community maintains a property owner’s association with yearly dues of $25 and includes the use of a community center building. There are POA bylaws but no overly restrictive covenants, conditions and restrictions (CC&Rs). The water in Lake of the Woods is provided by the resident owned municipal water company and flows through artesian sand spring basins in the north part of the region and into underground aquifers. You’ll enjoy fresh spring water straight from the source without concern for industrial and pharmaceutical contaminates. If you’ve been thinking about leaving the congestion and noise of the city behind for a peaceful alpine mountain retreat, Lake of the Woods offers a wonderful opportunity to own an affordable home surrounded by the unspoiled beauty of the national forest. Lake of the Woods is home to many Los Padres National Forest Campgrounds, hiking and ATV trails including Salt Creek, Cherry Creek, McGill, Mt. Pinos, Chula Vista, Sheep, and Pleito. Trail heads are just a few minutes away for access on foot, ATV, 4x4, and horseback. For maps and additional information on campgrounds, hiking and ATV trails in the Lake of the Woods area of the Los Padres National Forest, click on the following links. Lake of the Woods History – The Hunting and Gathering Camp of the Chumash Indians. From the days of the earliest people, and the Spanish who came in the 1700’s, the present area of Lake of the Woods was the “fork in the road” for travelers – much as it still is today. At the intersection of the road stood a lofty and noble Jeffery Pine tree, well known to all who passed there. The tree was known as the “Shrine Pine” but called the “Shot Pine” by the Chumash Indians, who were known to shoot an arrow into the tree for good luck when passing during the Piñon harvest. Other Indians were said to leave special items in the hollow of the tree for safe passage as they traveled through the area, which was a popular Indian hunting and gathering camp. The tree was hollowed out more in later years and the mailbag left there for early settlers of the area. One of those settlers, John Cuddy, found a lush green valley twelve miles from Fort Tejon where he was stationed. He built a log cabin about a mile west of present day Lake of the Woods in 1853. His son and daughter-in- law, Don and Florence Cuddy, subdivided the eastern portion of their ranch in 1925. Because of the good flow of water from the springs around their ranch and from the stream coming from Cuddy Valley to the west, they named the area, Lake of the Woods, for the lake they hoped those streams could establish there. With the help of a dam, the lake did establish itself by the 1930’s. In the 1940’s, Florence Cuddy encouraged development of the area with a commercial center, beginning with her real estate office. Soon there was a hardware store, café, motel, and gas station. The heavy rains of 1961-62 filled the lake to capacity. Florence Cuddy had the spillway opened up to allow more drainage. There were fears the dam might not hold, so families were warned to evacuate. When the dam did give way, it was said a 20-foot wall of water was seen as it passed down through the Frazier Park area, filling the stream bed all the way to Castac Lake. Several homes and the highway were destroyed. The present highway goes right through the old lake bed. Present day Lake of the Woods has a population of approximately 850 people. There is a popular RV park here, as well as various businesses. Homes in this area are popular for their proximity to Interstate I-5. Nearby Shopping – You won’t have to travel far. Lake of the Woods may feel far away from the city but all the essentials are close by. Lake of Woods offers residents two convenience stores, a pizza restaurant, a gas station, and a few other miscellaneous businesses. Neighboring Frazier Park offers retail shops, restaurants, markets, gas, hardware and lumber stores, a pharmacy, and the personal and professional services you would expect to find in a larger city. A few minutes west you’ll find the Pine Mountain Village with restaurants, a bakery, coffee house, gym, Pilates studio, hardware store, grocery and general store, gift shops and specialty stores, salons, and other personal and professional services. Nearby Lebec and Gorman offer fast-food restaurants, automotive services, a nursery, gas stations, hay and feed store, and lodging. For more information on the businesses and services available in the mountain area, see Local Business Directory. Lake of the Woods area Schools and the El the Tejon School District, visit the following websites. Main roads are paved and maintained by Kern County. Residential roads are graded, graveled, paved, and privately maintained. Power, phone, and cable available to each property underground. High Speed Wireless, Cable, and Satellite. Private Ambulance Service and Kern Medical Helicopter. Two medical clinics in nearby Lebec and Frazier Park. Major medical centers in Bakersfield and Valencia. Kern County Fire Department is located in Frazier Park. Los Padres National Forest Fire Service is located minutes away and lake water on Tejon Ranch is available for extraction. Kern County Sheriffs Department services the area from Frazier Park. El Tejon School District. Elementary through High School in Frazier Park and Lebec. Pine Mountain Charter School is located in Pine Mountain Club. School bus service is provided by the district. Distance—48 miles. For more information about, Valencia click the link below. Distance—48 miles. For more information about Bakersfield, click the link below. Distance—48 miles. Nonstop flights to Denver, Los Angeles, Phoenix and San Francisco and one-stop service to hundreds of domestic and international destinations. The new William M. Thomas Air Terminal at Meadows Field is now open. Distance—63 miles. Nonstop flights to destinations throughout the United States. Served by most major carriers. One stop service to hundreds of international destinations. Distance—78 miles. Nonstop flights to cities all over the World. Visit the Los Angeles Airport Website by clicking the link below. Directions to Lake of the Woods – A scenic drive from any direction. From either direction on I-5, take the Frazier Mountain Park Road Exit (205). Go west for about 8 miles. Turn left on Lakewood Drive to begin exploring the area. To reach our office, continue on Frazier Mountain Park Road west which will become Cuddy Valley Road and turn right onto Mil Potrero Highway. Drive 6 miles into Pine Mountain. Pine Mountain Village is on the left. You will see the Village Center sign at the corner of Mil Potrero Highway and Freeman Drive. Turn left on Freeman Drive and turn right on Pine Valley Lane into the Center. Continue on Pine Valley Lane until you see the Jennings Realty sign on the right. From either direction on the 101 Freeway, take the CA-166 exit. Take CA-166 east for approximately 70 miles. 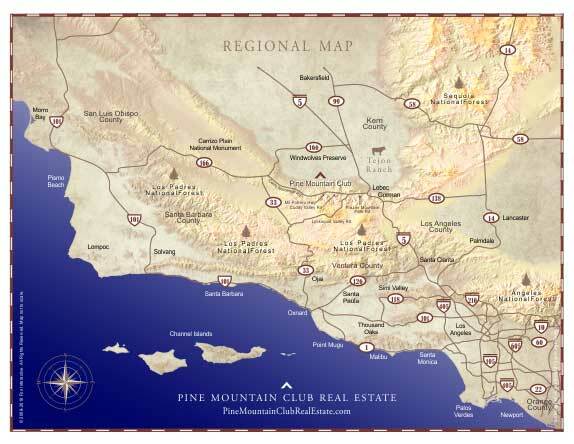 Turn right onto Cerro Noroeste Road and proceed for approximately 25 miles into Pine Mountain. Cerro Noroeste Road becomes Mil Potrero Highway. Continue on Mil Potrero Highway until it ends at Cuddy Valley Road. Turn left on Cuddy Valley Road and continue driving east. Cuddy Valley Road will become Frazier Mountain Park Road. Turn right on Lakewood Drive. Stop by our office and say hello or let me know when you’ll be visiting the area. It would be my pleasure to show you around Lake of the Woods and share my knowledge of the surrounding mountain area. Lake of the Woods Homes and Land for Sale – See every property listed in the MLS. For information on Lake of the Woods real estate, Lake of the Woods homes for sale, and available Lake of the Woods land for sale, follow the link below to search our listed properties in Lake of the Woods and the official Multiple Listing Service (MLS) that includes Lake of the Woods property listings provided by all local real estate offices. If you have any questions about Lake of the Woods or would like more information on a Lake of the Woods property you see during your real estate search here or anywhere on the Internet, it would be my pleasure to assist you and share my knowledge of the area.